TEN premieres UK drama Ripper Street at 8:30pm Sunday July 28 -which is a big ask to go up against Underbelly: Squizzy on the back of The Block auction. It stars Matthew Macfadyen, Jerome Flynn and Adam Rothenberg. Seven is yet to confirm its follow-up to A Place to Call Home but Bones is likely to take its place. Together with The Time of Our Lives it will become the hottest timeslot of the week. Ripper Street is an extraordinary detective series that takes a riveting new twist on the Jack the Ripper era. 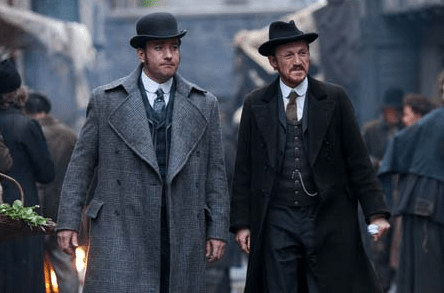 Starring Matthew Macfadyen, Jerome Flynn, Adam Rothenberg and MyAnna Buring, the eight-part series is not another backward-looking ‘Hunt the Ripper’ story, but a fictionalised trek into the heart of a London community living in the blood soaked aftermath of that forever anonymous killer. Between the factories, rookeries and pubs that mark out this maelstrom moves Detective Inspector Edmund Reid (Macfadyen) and the men of the police precinct he commands. They seek to bring justice to a world that is forever on the brink of mayhem, but these aren’t just men of the law. Each man has a back story that is shrouded by a cloud of mystery. Looking forward to Ripper, always been fascinated by Jack the Ripper. Love the Underbelly series too. Great to see Bones is coming back. Not sure about Selfridge, have to find out more about it and depends what it’s up against. I agree with those that think Seven will play Mr. Selfridge. But I guess we’ll see. If it was a choice of between only Underbelly or Ripper. Then I would choose Ripper. That said Underbelly Squizzy looks really good. I just can’t abide by the criminal POV however. That said I hope all have decent ratings. The only thing I dread is the horrible pop-ups. Which encourage me to avoid any channel that does it as much as possible. Mr selfridge will most likely be sevens replacement for the Sunday night I think! Will be giving Ripper Street a look. The later series of Underbelly have not been kosher – too much ham. I don’t think its going to be too ‘hot’ of a timeslot. The ageing Underbelly will have a good launch off The Block finale but will quickly drop off, similar to last year’s post Olympics launch. Bones is also an ageing drama, I’m expecting numbers similar to Criminal Minds. The Time of Our Lives hasn’t really fired. And Ripper Street is the only fresh drama but will probably suffer from a bad launch up against The Block/Underbelly. Having dominated Sunday nights with Downtown Abbey and A Place to Call Home it seems odd for Seven to just concede it to Nine and help Ten launch Ripper by showing Bones, especially when they are losing Monday to The Block and Hamish and Andy. Bones was only rating 500-600k when last in the slot. Seven has prefered Castle to Bones this year. Bones was bumped to Thursdays (where its ratings did get up to 800k against no other dramas) then dumped for Mrs Browns Boys when Top Gear and The Footy Shows started on Nine. I suppose they could run Bones and Criminal Minds and concede to Nine for while and then run Mr Selfridge later with The X Factor. But Seven have a load of stuff like Downton Abbey, Revenge plus more Castle, Bones, Scandal and Criminal Minds plus a couple of news shows available from the end of September if they need them. With The Block being Squizzy’s lead in, I don’t see this going very well, however, stranger things have happened. It’s bizarre scheduling to put two similarly toned period dramas against each other. But when its a choice between a much-acclaimed BBC production on Ten, or another installment of Nine’s amateur hour Underbelly franchise – which, if the previous series are anything to go by, will see a 2 hour plot stretched to fill 8 episodes – then it’ll be Ripper Street that gets an airing in the Prawn household. Bones ……….. did someone say Bones!! Id say these two shows would definitely cannibalise each other. Seen the first 3 eps. Not bad. I wanted to watch Ripper but will be watching Ripper instead. Surely Monday night would have been better. Bump Wanted to somewhere else.